If you would be interested in volunteering with our organization, please fill out our Volunteer form by clicking the button below. Thank you! 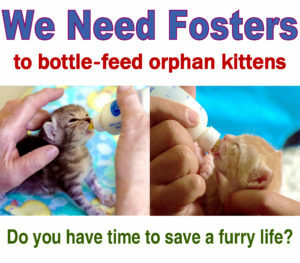 We are always in need of more fosters! Click the button below to fill out our Foster Application form. Once you have completed it, you can email it to us at kittykonnection12@gmail.com or send it to us via messenger on our Facebook page or print it and bring it to Petco in Evans, GA during our adoption events Saturdays 11-4pm or Sundays 2-5pm. Thank you!